Destructoid: "There are some classics that don't hold up today -- and there are some that absolutely need to be experienced by gamers of all ages. One of those classics is the original DuckTales on the NES, which set a gold standard for licensed games everywhere going forward." MTV: "Pogoing onto slow-moving enemies or swinging Scrooge's cane like a golf club have been mythologized so much in the popular gaming consciousness that it's easy to forget that "DuckTales" (and now its remake) expand not at all on its hero's core abilities." USGamer: "I reviewed the original DuckTales on NES over two decades ago and thoroughly enjoyed playing it, rating it a very solid 90%. So, of course, I was hugely interested to see how this "remastered" version would span the decades – and just how the developer would tackle the tricky task of bringing the game up-to-date, while making sure it keeps its original looks, feel and atmosphere. Turns out WayForward did a decent job, but in the process has managed to create some new issues that the original didn't have." 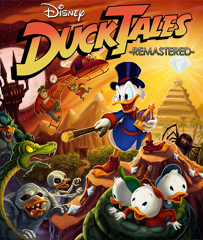 IGN: "Then again, nothing clouds memories like nostalgia, and that’s where talking about DuckTales: Remastered gets dangerous. The thing is, the very existence of WayForward’s HD remake of Capcom’s classic NES platformer – 20 years after the last episode of the cartoon aired and 23 years after Capcom released the game – begs a simple questions: was NES’ DuckTales really as good as we remember?" Polygon: "If WayForward and Capcom's end goal was to recreate DuckTales while modernizing the presentation, they've accomplished just that. But other modern updates to classic NES titles have found more accessible, appealing ground, paying homage while improving the weaknesses of the source material. Instead, DuckTales: Remastered is full of miserably dull and frustrating mechanics behind its updated presentation — and no visual overhaul can hide that." Escapist Magazine: "DuckTales: Remastered doesn't try to do anything new. What it does, however, it does with a sense of style that doesn't spoil your childhood memories. Likewise, the updated graphics and interface don't detract from the retro feel of the game. It still feels like you're playing an NES game, but the easy pogo option, the character voices - some of the original voice actors from the animated series were actually tapped for this re-release - and the saved game system genuinely enhance the experience." Posted on August 13, 2013 by Eugene Huo and filed under Reviews and tagged Disney HD capcom cartoon ducktales remaster. Disney today announced its video game that blends Skylanders-type figurines, game levels, and an open "toy box" where you can create your own games. 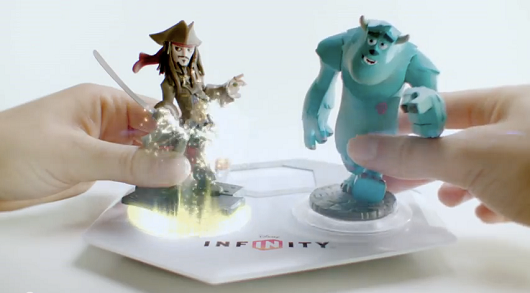 Positioned more like a platform than just a game, Disney Infinity is poised to rock the gaming world. The initial Disney properties represented are Monsters Inc, Pirates of the Caribbean, and The Incredibles. OMG will there be a Boo playable character for Monsters Inc.? My brain just melted. WANT. Posted on January 15, 2013 by Eugene Huo and filed under News and tagged Disney boo collectible figurines game monster inc pixar skylanders.